This event took place on between August 27th and 29th 1982 in a reservoir in Del Mar. There were 30 Pro/Am freestylers, cut to 20 for the finals, and 19 Open Amateur freestylers, cut to 10 for the finals. 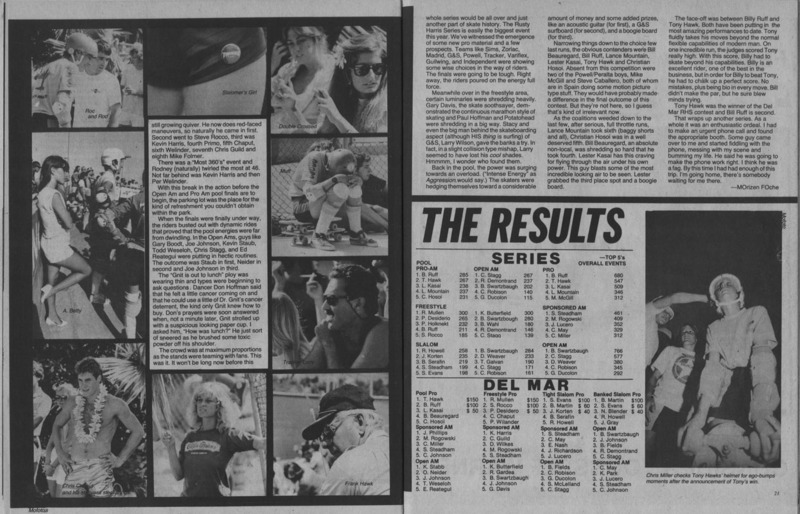 Stacy Peralta and Paul Hoffman were automatically qualified for the finals, though their final placings are not known. Alan Losi, upon making several errors in his routine, performed a strip tease as part of his run. Ken Parks, and Mike Siegfried also competed in this contest but their placings are not known. Thrasher provided full events for the contest, whilst Transworld provided combined Pro/Am results.